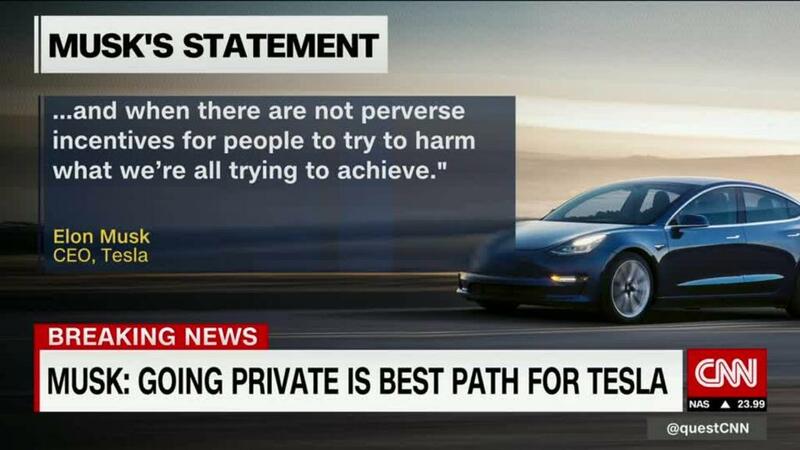 Is Elon Musk taking Tesla private? Arianna Huffington isn't buying Elon Musk's line about being too busy to sleep. The two high-profile entrepreneurs continued their running debate on the merits of catching more Zs on Monday. Huffington's latest comments add to a nontrivial discussion that started last week when she published an open letter urging Musk to ease up on the 120-hour weeks and quit sleeping at the Tesla factory. Musk, who admitted in a tearful interview last week that the past year has been "excruciating," took to on Twitter in the wee hours Sunday to tell Huffington, "You think this is an option. It is not." Huffington, founder of wellness website Thrive Global, where she published the open letter, refuses to accept that. In fact, she sees a teachable moment for all of Silicon Valley, and the world beyond. "This is not about sleep, or about slowing down, or about asking Elon to chill out under a mango tree," she said in a statement shared with CNN on Monday. "It's about how we can unlock and sustain our peak performance, and see solutions and opportunities where others can't." Huffington said the nation's work culture deludes people into believing that burning out is the price of success. "As all the recent scientific findings show, the opposite is true," she said, noting people "perform better" when they " take time to refuel and recharge." Refueling and recharging has been difficult for Musk, who recently admitted to taking Ambien to sleep. Last week, the New York Times published an emotional interview in which Musk called the past 12 months "the most difficult and painful year" of his career. His long hours at Tesla has drawn concern from friends, Musk said, and has come at the expense of spending time with his family. Among other things, Musk has grappled with production setbacks for the Model 3, Tesla's first mass-market car. The company recently achieved its production goal of 5,000 Model 3s a week. As if that weren't stressful enough, Musk recently tweeted that he plans to take Tesla private at $420 per share, an announcement that prompted two lawsuits and reportedly drew scrutiny from regulators. Huffington, who sits on the board at Uber, has been on a tear about sleep in recent years. Thrive Global, which has grown to 77 global employees and raised about $43 million since its founding in August 2016, strives to help people reduce stress and burnout through its media site, digital workshops and products including a podcast and a Thrive app. "It's impossible for any business to scale when it's dependent entirely on the 24/7 presence and control of every element by the founder," she continued in the statement. "Building a leadership team and effectively delegating (the way Elon has done at SpaceX), cannot be done while you're running on empty. And this is true for all us." -- CNNMoney's Jordan Valinsky contributed to this report.